This is a joint set with the gorgeous, incredibly patient and kind Celestial Spider. 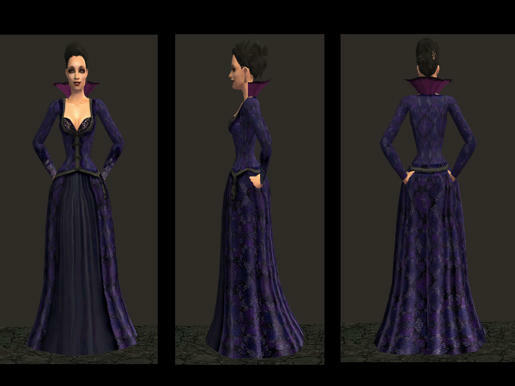 She made the gorgeous Evil Queen gown mesh for the darkly glamorous outfits below, with a fantastic alpha-editable over skirt and collar! I've included the file in my 'Meshes' folder, with her base colours (very helpful for all you recolour people out there for figuring out what goes where.) She is one of my favourite meshing wizards here at the Keep. Okay, on to the outfits! 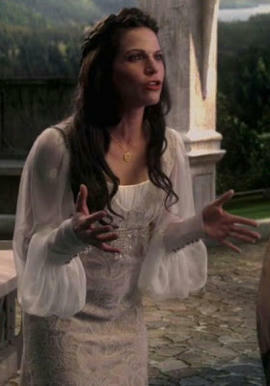 This is Regina's first outfit when we see her as a young, innocent girl, pre-dark plum lipstick and tragic backstory. I've checked this outfit on Dragonslave's object horses, and it looks pretty good for riding through the countryside! 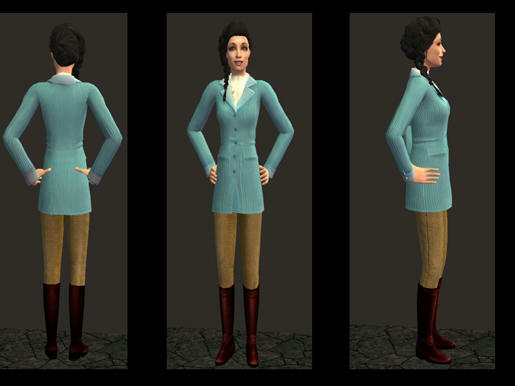 I went for a relatively simple mesh - one of Cocomama's default base game velvet jackets with riding boots added. Included in the mesh package. 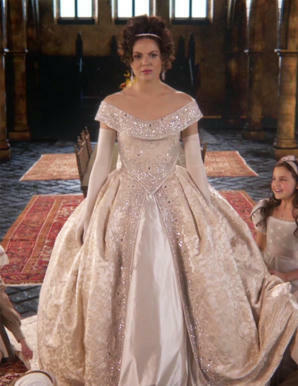 Probably one of my favourite dresses for Regina, although from a pretty heartbreaking scene! I won't spoil it for anyone, but it's a turning point for Regina between hero and villain. 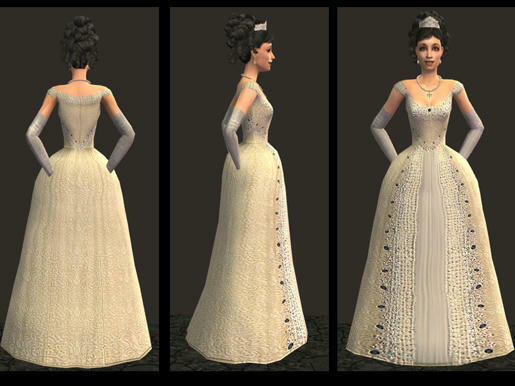 The mesh used here is heget's 18th century court gown mesh, included in the mesh folder. Appropriately regal! A pretty iconic look for Regina here! and thanks to Sunni and Frac's apple trees, Regina can now offer apples to any Snow Whites of her choosing in this! My first use of Celestial Spider's mesh with the collar. 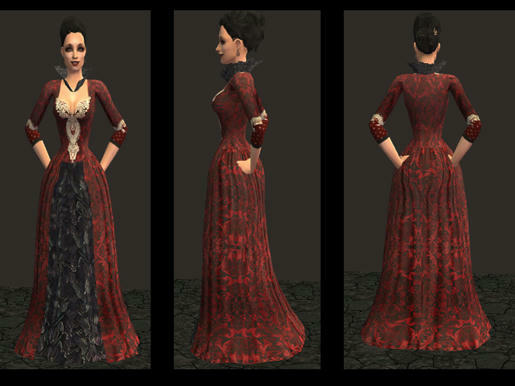 This would also be a pretty nice look for vampire ladies as well as dark witch queens. 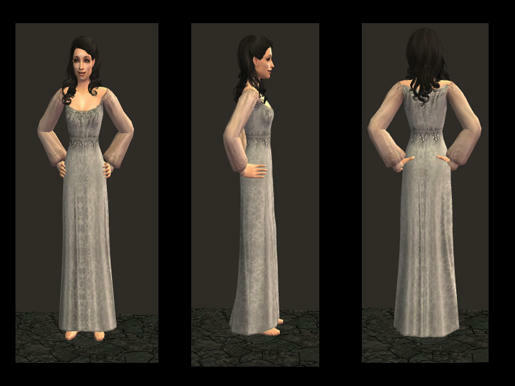 This one is named after the episode you first see it in during Season 3 - and you can see why the fans remember it, it's a lovely outfit! I especially like the raven-feather collar. 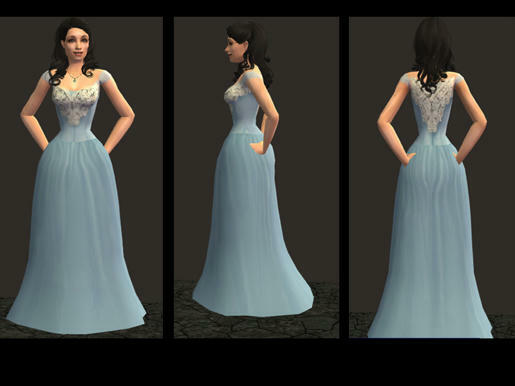 Another use of CelestialSpider's versatile custom mesh. Something a little more casual for a queen to slip into. I'm not entirely sure if it's a nightgown in the series; Regina tends to wear it as the fairytale version of sweatpants and a t-shirt, but I thought she could probably use this as PJs, no problem. Enjoy, everyone! I've double-checked that the meshes included do work, and they're filed separately in a "Meshes" folder for ease of organising.